My Blog is entitled ‘Loves and Hates’, but apart from the state of the roads in Nova Scotia, I haven’t written about many ‘hates’. Something that really struck me when we first arrived here, was the overhead electric cables. My extreme dislike of them hasn’t really reduced any with time, but perhaps I am a wee bit more tolerant of them. I’m pretty sure though, that any of you visiting from the UK will be appalled on seeing them. They are not a pretty sight and spoil the looks of some of the fine buildings. They are not so bad in the country, but they clutter up the streets in the towns. This is a typical street scene. 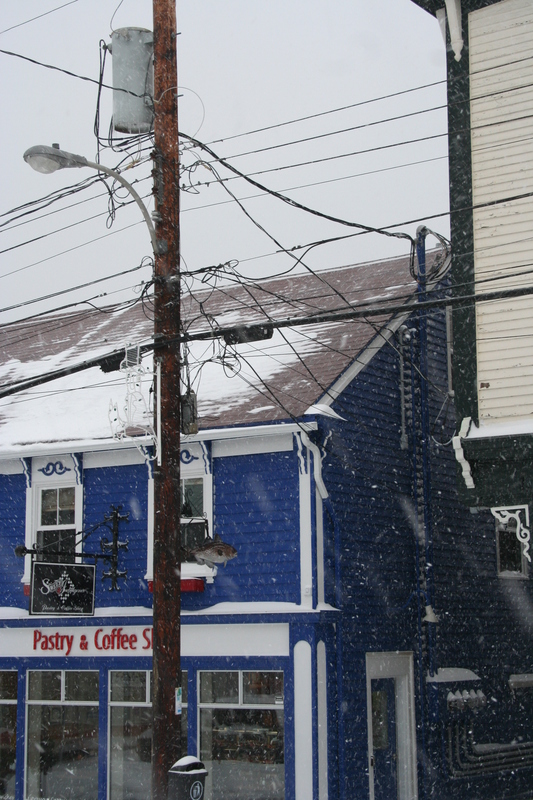 This tangle of wires hangs in front of a great little coffee shop and the Lunenburg Post Office. Many of the poles have these beautiful metal fish sculptures. Here, this little gift shop has its own clutter of wires outside. But can you spot the Christmas decoration amidst the mess of cables? 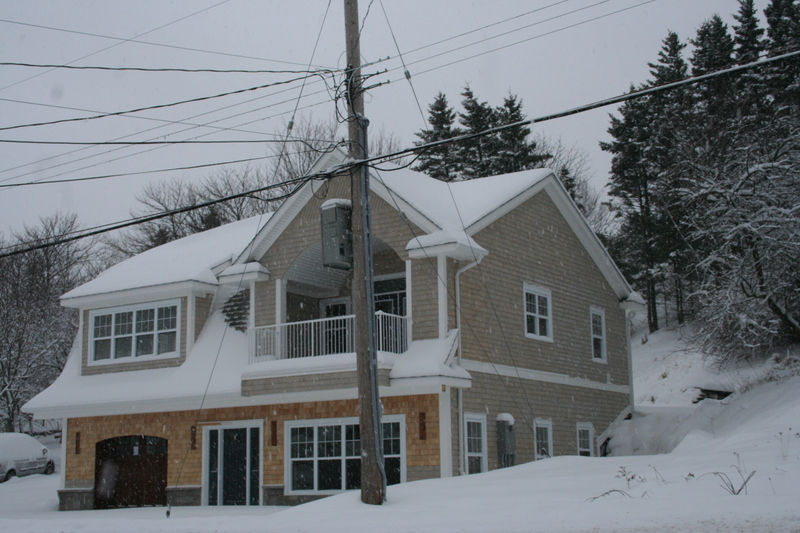 This brand new house has this pole between it and the view of the harbour! 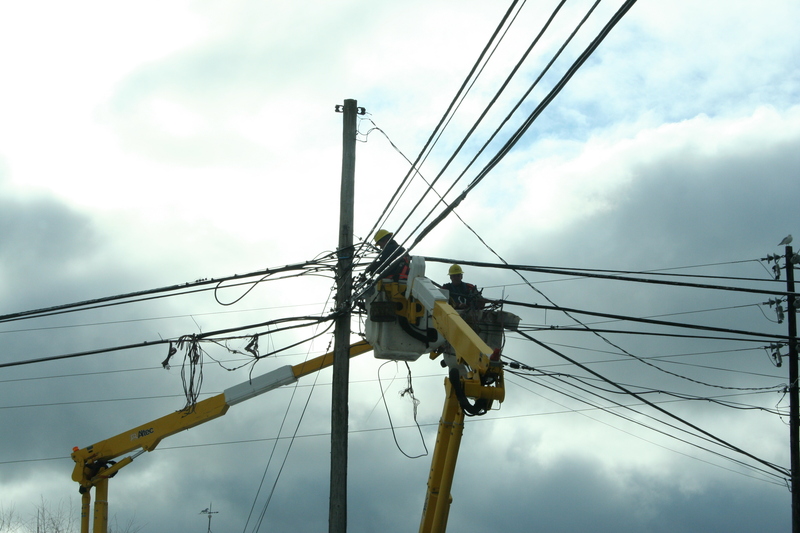 Apart from the ugliness, the trouble with overhead power lines is that any storm causes problems and loss of power. 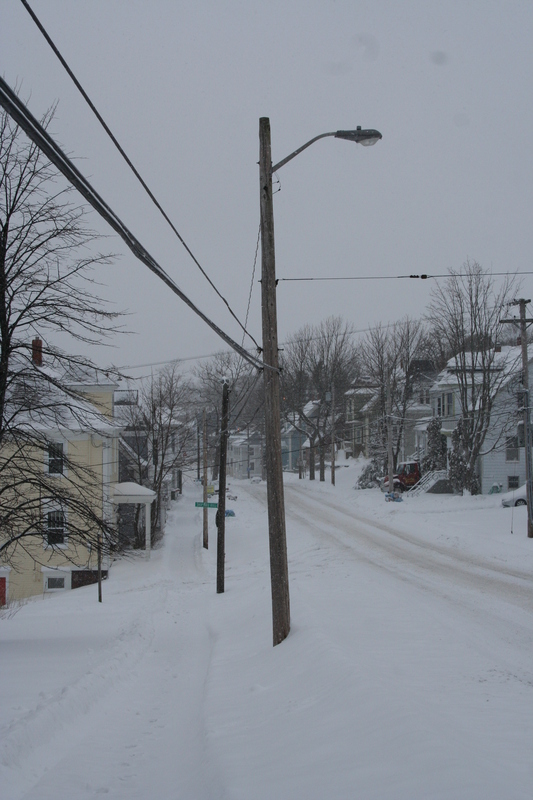 But Nova Scotia Power and Lunenburg Electric are very quick to make repairs. 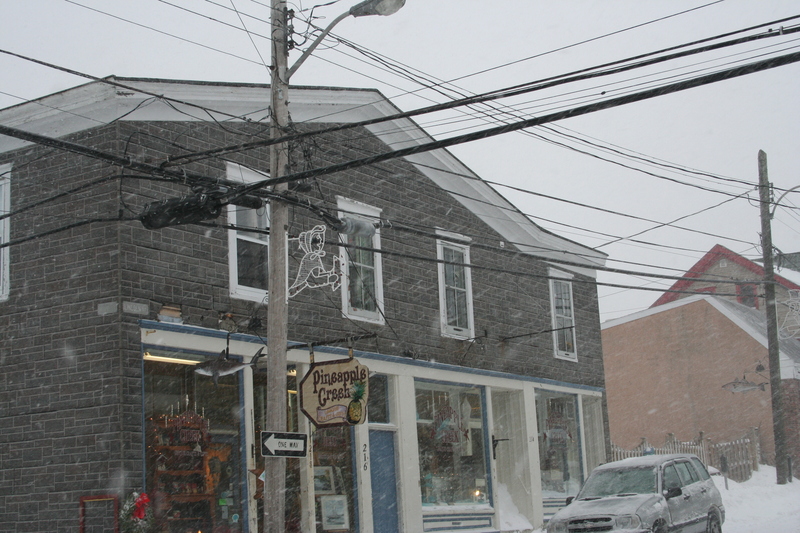 Seemingly, a few years ago, a film company, producing a film in Lunenburg, offered to remove the poles around the town and put the cables underground. But not everyone agreed with this kind offer and so it never transpired. Some people even saw the removal of the poles as a loss of their heritage! What are you readers thoughts on this subject? No one had any comments about the coloured wooden buildings, but perhaps this Blog will evoke some response. Do you hate them, like me, or just see them as a necessary evil? OMG. I have to say that I have not seen for a long time anything like these. In the Mediterranian area this kind of style is general, but in Canada, that is a great surprise to me. We have of course cables, but nothing like those You have shown. Nowadays when people are building new houses (detached houses) all the cables are digged and protected into ground. So do we have also, although our house is 16 years old. This was interesting post to me, Thank You. This week I am starting posts in tripartite from an arctic town called Kemi, next will be on Wednesday from special colored church and on Friday there the climax, but what it is… I do hope that You love all of them. Best regards from cold and snowy Finland. I see that there are no overhead cables in Kemi, yet it is so far north. Here in Canada, it is obviously all about cost. People building new houses try to have the cables put underground if they can afford it, but that new house in my photo is in the town and the wires are serving the whole street. when I take photographs, I have a great deal of trouble trying to cut out the electric wires. Sometimes it is impossible! I hate the wires (always have), love the colourful houses. I’m from Newfoundland, St. John’s, where there are many many colourful houses in the downtown. Meanwhile, these last 8 years we’ve lived in Britain (OH works in Glasgow at present but we live in the Cotswolds); all that’s to change, however, as we’ve bought a place on the south shore of NS. So perhaps we’ll meet! Just found your post today and enjoying it, thanks a bunch. Coming here from the Cotswolds, the wires will annoy you, but hopefully everything else (apart from the state of the roads) will compensate for what you will lose. The hills, the little coffee shops, the pubs, Marks and Spencer …. these are a few of my favourite things, that are not here. But the natural beauty of the coves and shoreline is amazing, driving is so easy and stress free, the people are so friendly… this is what I love about the South Shore. Thanks for commenting on my Blog. We’ll meet up! Wonderful notes! I also hate the wires. You mention they spoil the look of the buildings. Well they also spoil so many possible photographs in rural central Ontario. They are Guaranteed to be on the best side of the road for a picture!